When you join our collective of Global Investors, you will have special opportunities to connect with likeminded individuals, participate in events, and partake in unique travel opportunities with The Hunger Project. Our Global Investors are a community of everyday ordinary people who are committed to making an extraordinary difference. In New Zealand, more and more of us want to play a role in ending hunger. Many of us believe that there is more to life than just consuming. More importantly, we want to know that our life matters. As a Global Investor you are mirroring the courage and bold leadership of our village partners. In return, you are connected with a movement of people who are taking a stand for the end of hunger. Through partnering with us, you will make a difference that will change lives and transform the world. We use the word “invest” purposefully. Our investors receive a social and personal return on their money. Your money is shaping a new world. 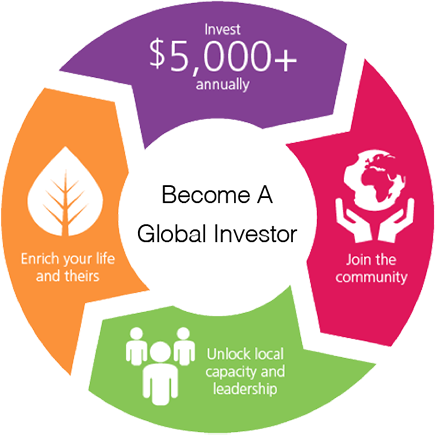 As a Global Investor you contribute a minimum of $5,000 annually. This may mean re-prioritizing how your money is spent. Investing at this level not only impacts the hungry, it has a profound impact on the investor. In giving, you will receive so much in return. CONNECT, STRETCH AND MAKE A DIRFFERENCE. Our Global Investor community of like-minded individuals, families and companies believe that we can end hunger in our generation and take action with their money to bring this about. We’re are building a movement of Global Citizens who stand shoulder to shoulder with the most impoverished people on our planet. TOGETHER, WE ARE ENDING HUNGER. JOIN THE GLOBAL INVESTOR GROUP.